Danzcue Girls Rainbow Skirt Ruffle Tiered Tulle Tutu Skirt by Danzcue at H Highland. MPN: DQOS006-Multi. Hurry! Limited time offer. Offer valid only while supplies last. The Danzue layered rainbow dance tutu skirt is easy to slip on with elastic wasit band and is super light weight with brigh colorful mesh material. 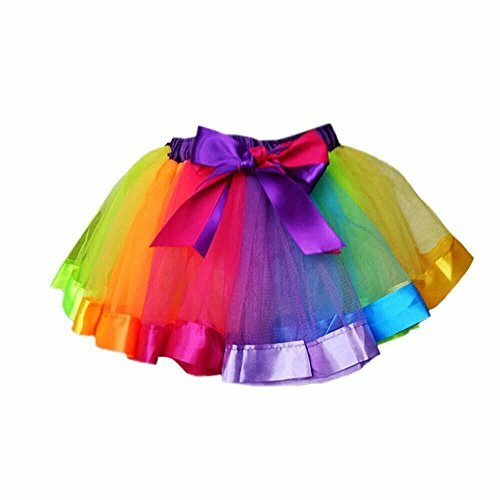 The Danzue layered rainbow dance tutu skirt is easy to slip on with elastic wasit band and is super light weight with brigh colorful mesh material. This look is perfect for any dance wear, such as holidays, performing arts and etc. Elastic waist, waist is 9.85", length is 11". 100% Polyester Made. A little trough, leggings or shorts are recommened.